The EFF leader says those calling the new finance minister ‘incorruptible’ must be talking about a different Malusi Gigaba. In a press conference on Friday afternoon, EFF president Julius Malema was scathing of President Jacob Zuma’s latest Cabinet reshuffle, and warned South Africa not to feel a false sense of security just because the new finance minister, Malusi Gigaba, “is someone they know”. He alleged that Zuma had now achieved his capture of Treasury, which meant the Guptas had captured Treasury. “Malusi is corrupt to the core. There were serious allegations against him for having that foreign offshore account. We were told of huge amounts of money he exchanged with his friends. He said such money could only be “corrupt money” he received from the Guptas. “Malusi is a regular at Saxonwold Shebeen. He has never denied that. We have just placed Treasury at the gate of Saxonwold Shebeen. 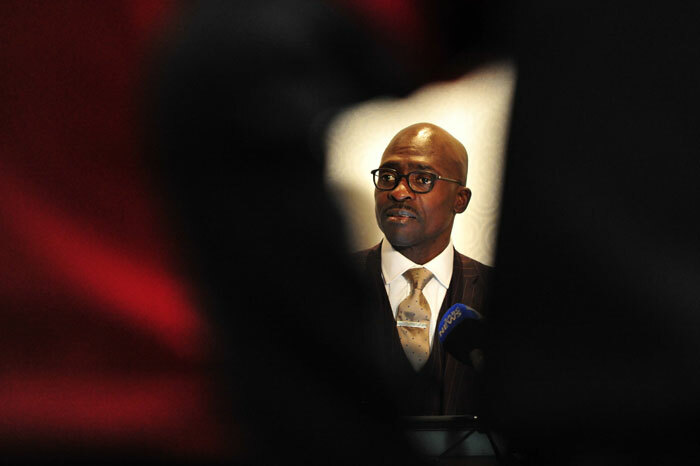 He alleged that Gigaba was among those Cabinet members that Science and Technology Minister had been referring to over the weekend when she charged that some of her colleagues were living beyond their means. Malema alleged that Gigaba had a house in Cape Town that had been bought for him by the Guptas. The EFF also spoke about the EFF’s strategy to either have Zuma impeached through the courts or removed through a motion of no confidence in parliament, which would require at least 70 ANC MPs to vote against Zuma for the first time.